In Cameroon and southern Nigeria, the critically-endangered (IUCN. Red List, 2008) Gorilla gorilla diehli is down to about 280 individuals. The sub-species of the western gorilla is best known nowadays because it has been found trying to respond against incredible odds. Fighting to protect themselves from bushmeat hunters, individuals have been observed throwing clumps of grass and even sticks, whereas normal responses always involve running away. To assess the population better, Richard A. Bergl, Ymke Warren et al, in Oryx, the International Journal of Conservation, have been employing remote sensing analysis to discover dispersal corridors and hopefully a slightly larger population than had been thought. It would be appropriate to sadly note the untimely death in 2010 of the author, Ymke Warren, who led the Cross River research. Already, conservationists have been ensuring access across the national boundaries so that the gorilla can travel from one national park to another. Here we see potential for much more access between quite isolated groups of the sub-species. The far north west of the Biafran highlands was chosen for its species richness and endemism, plus its forest corridor between Nigeria and Cameroon. The southern boundary of the study area was the Cross River itself. 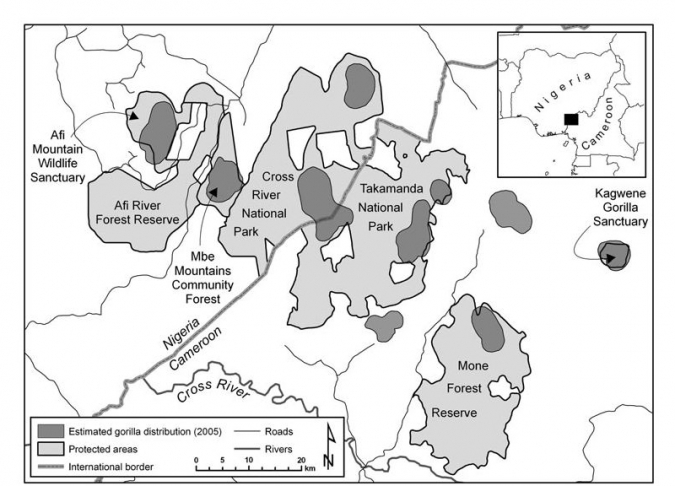 Having defined the precise gorilla habitat and corridors along which the animals can travel, at least 8000 km2 of forest, adjacent to 2500km2 of gorilla-occupied territory were identified. After surveying twelve areas potentially suitable, ten proved positive resulting in a 50% increase in the known range of this rarest gorilla! Whileconservation for the gorilla has been exemplary, too little was known about habitat fragmentation and movement patterns. This research will now be invaluable as researchers try to expand upon the literal breakthrough in the gorillas' forest links. Landsat 7 images were used, producing land-cover classification in seven categories. GPS control points checked the efficiency of the images and then all reported sightings were placed on the map. Dispersal was cleverly assessed next by using least cost analysis. So the path of the gorillas across this artificial landscape was assumed to be similar to the actual corridor they used in most cases. Who knows what the groups actually do when nobody's looking, but this research approximates very well to the actual possibilities within the forest for the animals to move, feed, avoid harm and survive! Results indicate 7 Cameroon habitats and 5 Nigerian habitats suitable for the sub-species, with forest showing most suitable and farmland and grassland the least. The land cover classification was, "highly accurate," at 90%. The non-fragmentation of the present gorillas' habitats was pleasing, while potential linkages across the areas were quite plentiful. 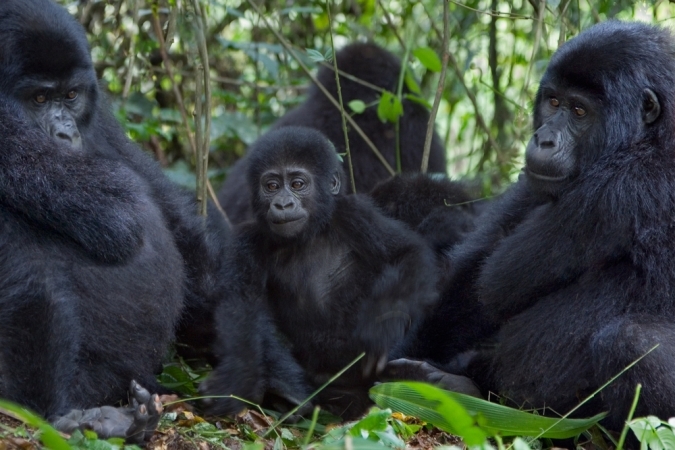 Roads and farmland provided the least secure situations, possibly isolating gorilla groups in the near future and provided access for hunters. The "least-cost paths" were all between 3 and 27.2 km long, but as we implied the results show that some of the direct routes would in practice, be unrealistic for a group of gorillas. Any farmland in the way would pose threats. New evidence of gorillas found by the survey team produced six sites out of the seven proposed in Cameroon and four out of five in Nigeria. Rewardingly, many new finds corresponded to the equally new areas for potential corridors linking the population. The challenge now is to find more about the sub-species ecology. Their habitat requirements are paramount for conservation to be successful, but we know so little about these particular "ecotypes." Even their food-plants need to be investigated. Hunting has decimated what must have been a very large population in a highly suitable forest. With little protection in many areas, the potential isolation threat is one to face. While corridors exist, genetic analysis of stools confirms that these gorillas are of the same stock. Isolation will produce new dangers of inbreeding and of course the restriction of habitat as encroachment continues. Carbon sequestration funding and new conservation leasing arrangement with forest authorities are suggested as future protective devices for the essential corridors of land. It's commendable that we can now see feasible ideas coming from those who aim to protect and conserve animals and plants with financial guidance. Hunting controls are yet to be successful, as populations in agricultural areas increase. Other species are most affected at the moment as educational action proves to be successful here against the gorilla pogrom that horrifies people in other areas. The fight is on.